In the mosaic world, Sonia King is a well-known reference. An artist, an international instructor, and an author, her style is abstract and very rich. She works with space, reflection and texture. All her tesserae are cut by hand and she uses a technique she developed herself to grout big pieces; she does not grout the smaller pieces to allow each tesserae to retain its identity. She has recently created a new piece for the new main lobby of Children's Medical Center of Dallas: Nebula. It won a second international Spectrum Award for her creative use of tile and was selected for exhibition at Ravenna Mosaico, the First International Festival of Contemporary Mosaic in Ravenna, Italy. 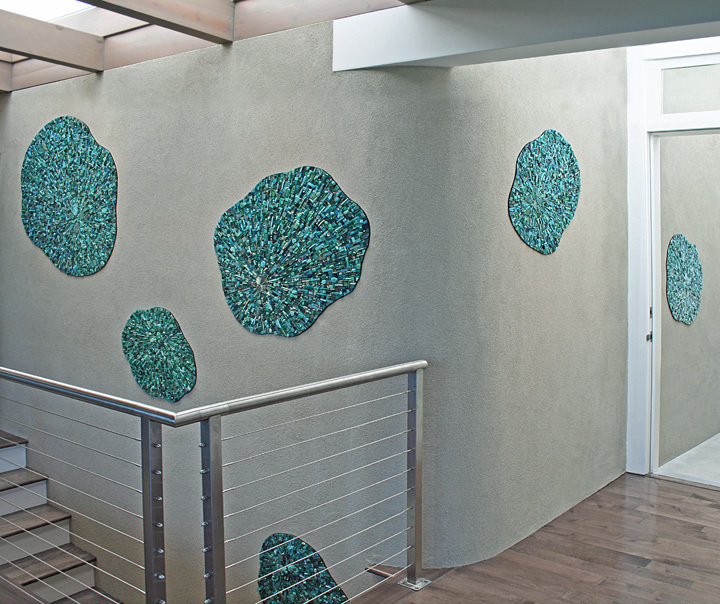 The mosaic mural is dynamic and a focal point in the building. This is actually her 5th piece on the Center’s walls. Due to the success of the previous projects, King was given a prime location in the main lobby on a curved wall; a place filled with natural light during the day. King took way he mosaic will be viewed into consideration and designed it in a way that creates maximum impact on the viewer. She looked for the various points of interests as the mosaic in the chosen location would come into view. The importance of the Nebula Chroma mosaic increases from the unexpected associations of tiles interacting in different ways: color, scale, texture, reflectivity etc... The creative process is complicated as decisions about size, shape and color are primordial. A great variety of materials were used that were brought from all around the world: glass tiles multiple types of ceramic, agate slices, marble gems, beach glass, art glass, vintage mosaic glass and much much more. All in all, over 200 different kinds of tile more than 20 manufacturers were incorporated in the project.